Rematch time! Bret had brought a Circle tooled Kaya 3 list that I was aware of ahead of time. I had honestly been hoping to dodge this matchup, but his team swooped in and made me take it anyway. So let's recap - he ignores forests for charges, his Wolves will be able to either A) seriously mess up my placement or B) come in and contest on a crucial turn, and he has accurate, powerful shooting at ranges that I can't retaliate from easily. Good times. I DID win the roll off and decided to windmill slam first. Bret took the side with the wall, and we were off. Apparently I didn't take a picture of my deployment, but it basically looked the same as usual. I do what I always do, kill some Bone Grinders and run up. Loki gets in some Shifting Stones and I get ready to threaten both flags. Things move into the trench. The Stones spread really wide (the CA is interesting for sure), and Kaya doesn't cast anything at all (go Woldwyrds). All the Purebloods are spell warded sadly. I can easily hook the Argus in the trench with Loki warping hunter, and kill it dead with Wyrds. I should be able to kill the Stone Keeper with one of my Sentry Stone units and that will render the unit basically useless for a couple of turns, which I like. Loki moves up and hooks the Argus and kills it by himself. Sentry Stones miss the Stone Keeper, so I have a Wyrd blast the Stone in the trench. I have to really move things in to prevent the Wolves from ambushing on my face, so everything goes central. I contest the left flag best I can, and put something on my flag to prevent Bret from ignoring that half of the table. I pop my Feat to prevent sprays from seriously messing up my densely packed models. Lots of Shamblers die. The Bokur dies. My flag gets contested by the Stone Keeper. Goal for this turn is contest, control, and kill the objective, which is going to be hard because it is Bunker. Wurmwood gets a Curse of Shadows on it which helps, but it takes a lot of shooting and some charging Mannikins to kill it. Loki hooks the Pureblood, leaving it on half health. The Woldwyrd moves up and nearly kills it. My Pureblood sprays it, boosts and...misses. Uh oh, that's bad. Bret decides it's go time. Kaya casts Synergy and kills some Shamblers before healing the battered Pureblood and repositioning back. The Argus kills another Shambler. The bottom Pureblood goes Ghostly after the Wyrd kills the Shambler in the way and charges the objective, killing it. He contests with his top Pureblood, which was Primaled and also kills Loki easily. I have a legit assassination run here because I can get all three Wyrds on Kaya if I Hellmouth her back, and that should kill her. Unfortunately, I make two crucially bad decisions here. I Primal the Pureblood, mistake number one, and then use it to kill his Pureblood. MASSIVE MISTAKE. I should have thrown it out of the way. Because I killed it, Kaya is camping six instead of two. I go for it anyway, and the damage rolls are so bad. At dice -4 on four dice, I did 2, 3, or 4 at least half the damage rolls. Even so, Kaya is on two transfers and 3 health after the barrage. If I'd just thrown the Pureblood, she would have been dead. I contest again and score once more. Bret breathes a sigh of relief and packs Kaya with all the stuff he can. He contests my flag with Ambushed Wolves, and scores another point. I forgot to take a picture of this turn. Because my Pureblood frenzied, I have no way to kill enough models to ride this out, so I go for another assassination attempt. This time, Kaya doesn't have an upkeep on her, so it really needs fire dice. I miss every shot, and Bret scores his fifth point. Sadly, Defeat for the Druids. I got tunnel vision wayyyy too hard this game. I should have realized that I was saving Kaya's life by killing that Pureblood. One simple change to my turn there and I win this game. Unfortunately, I realized this one turn too late, and by then it didn't matter. A well played game by Bret, looking forward to our next match! My team lost 1-4 this round. We had taken a solid beating the round before, and my team was getting pretty frustrated going into round 3. We needed a win here. I ended up against Skorne with Zaal 2 being his most likely drop since he denies Wurmwood souls. I decided to drop Kaya in a fit of "screw it", and off we went. The Scenario was Recon, and I won the roll, choosing to go first. My opponent took the side of the table with the forest to hide Zaal behind. Fog of War goes up, and everything runs. The Feral even warps speed and runs sixteen inches. Loki gets in his nice Shifting Stone palace. Zaal moves up, casts Aura of Power on himself and Vision on Hakaar. Everything else runs at me, the TyCom giving the Karax pathfinder. I see two avenues here. I can kill...almost literally everything in his entire army, or I can kill two models, port Loki up, hook Zaal and call it a game. Kaya casts Synergy and Feats. Argus and Pureblood go in and build up the chain, repositioning back. Blackclad #1 sprays down the two Immortals blocking my drag path. Loki gets ported up, warps Strength and boosts to hit Zaal, needing not triple 1s. I hit, dice -1, and yank him in. I bash him a bit more before repositioning out of melee. Blackclad #2 casts Hunters Mark at Zaal. The Feral warps Strength and charges Zaal for free. Zaal is at 6 boxes with one transfer left at this point, and the Feral kills him on his third initial. Ah Loki. I love you so much. If I hadn't gone for that, the plan was for both Blackclads to charge Immortals and then get Battle Wizard Sprays to clear nigh unto all of the unit. Sentry Stones kill Karax easily when not in Shield wall, and Slingers die to everything. I think at the end of my turn, my opponent would have had his Arcuarri, a few Karax, and an immortal or two, plus his rather pillowfisted battlegroup. Kaya at DEF 21 in the rubble and under feat isn't dying to spell assassinations, and I proceed to win on Scenario over a couple of turns. My team went 4-1 this round, with two games ending in assassination and 5 control points and nigh unto max army points. A good end to Day 1. Day 2 games coming shortly! The American Team Championship is basically right around the corner (eek! ), and thanks to the recent Una "balancing", I was scrambling for a replacement second list with just days to think about it before list submission. My team really needed another ARM smasher, and so it was that Circle's newest Warlock made her way into my roster. Oh boy do I need practice. For our game night yesterday, I rolled off to play my Skorne buddy who had Naaresh and Mordikaar with him. I dropped Kaya (Wurmwood seemed like a bad choice) and he dropped Naaresh. I won the roll off and slammed going first on Recon. I put my pathfinder heavies on the side of the table with rubble. Loki really threatens the whole table with Shifting Stones, so I also made sure that he was on the same side as they were. In post game discussion, my opponent and I both agreed that Tiberion should have been opposite Loki rather than the Sentry. Tiberion can't be dragged, which is a bit of a problem for a wolf with a drag hook. He has no shooting, so...time to run? For the first time in a very long time, my Sentry Stones both roll max Fury. Stones run aggressively forward. Loki warps Preternatural Reflexes because it sounds cool and runs. The Stalker warps Prowl and runs. I get to warp Speed on the Feral and fling him up the table. The Pureblood warps no spells and runs, and the Argus runs. Kaya puts up Synergy and charges Tiberion. The left Blackclad runs, the other uses Phase Jump to buddy up with a Shifting Stone. My Feral is nearly threatening his deployment zone, so Naaresh is going to have to Feat Defensively. Beasts run up, with the Sentry leading the pack on the right side. Tiberion runs as well, but isn't quite able to get into Shield Guard range of the Sentry thanks to the objective. Naaresh gets whipped a few times, then hyper regens the health back. He moves up, puts Blur on a unit of Beast Handlers, Lamentation on himself, and pops his Feat. 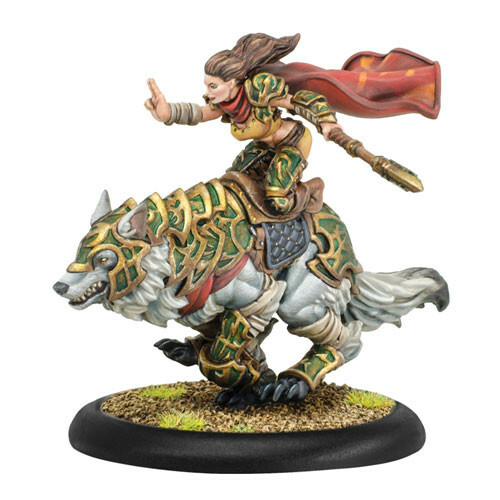 I have an interesting thought that involves Kaya popping her Feat and the Feral trampling through Tiberion and the objective to land next to Naaresh at MAT 12 PS 20, but I don't know how her Feat interacts with tramples and I don't want to take the time to look it up (I need to do that today). Instead, as you can see in the picture above, I think I'm going to yank the Sentry at me and eat it. Kaya upkeeps Synergy. I deploy my Gobber Chef, who I had forgotten about somehow. Firstly, the Mannikins on the right move over and spray the Tyrant Commander to death. Loki warps Strength, moves to within 8 of the Sentry, and boosts hit and damage on it, doing an impressive 8 damage and dragging it in. His free attack contributes another 3-4 damage, leaving the Titan on half health and Synergy at 1. He Repositions back between the two left Shifting Stones, staying in the Sentry's melee range. The Stones port the Stalker behind the Sentry to ignore the shield, and he finishes him off before paying two for Lightning Strike and moving back outside of the Bronzeback's charge range. Synergy is at two. If I could get it to three, I'm thinking pretty seriously about Feating and throwing the Feral at Tiberion with Primal. I can almost certainly get a Hunters Mark on him, and a free charge at dice -2, followed by 5 more dice -2 and one dice -3 averages out to a dead Tiberion by about 4 damage. Unfortunately, I can't, so to prevent myself from even thinking about it, I move Mannikins in the way and spray the Standard Bearer down. The Feral backs up to 11.1 inches from Tiberion, and the Argus backs up and toes the zone. The Pureblood goes on the hill to the left and also stays 11.1 inches from Tiberion. Kaya dumps down to two Fury and gets 16.1 inches away from Naaresh, and I pass the turn. I really like my position here. He can apparently get Despoiler onto Loki (I forgot he got errata'd to have a reach weapon), but Oddsmachine says that has a 7% chance of killing him, and he can't get anything else into my army. His objective heals both Despoiler and Tiberion to counteract the Feat. Naaresh upkeeps Lamentation, but drops Blur. Despoiler gets enraged and has Rush cast on it by the Gladiator. He charges in and kills the Sentry Stone and does about 1/3 of Loki's health to him. Bronzeback moves into the zone as a counterpunch, and Tiberion moves behind the wall on the left. Naaresh stays far, far away from the Feral. I leach three Fury with Shifting Stones, and then pull the rest with Kaya, who upkeeps Synergy. I start things off with Sentry Mannikins, which was a mistake, and they charge/run to engage both Tiberion and the Gladiator to prevent countercharge. I should have cast Hunters Mark at both of them first, but oh well. The Argus moves in and Doppler Barks at Despoiler, combo strikes, and boosts damage, doing an impressive 10 damage at dice -2. Kaya premeasures to make sure her beasts will all be in control where I want them, heals Loki for a few, and pops her Feat. Loki gets ported behind Despoiler, and then warps Strength, dragging him in. He easily finishes the beast with Synergy buffing his melee output, and the Repositions back. I spend both Blackclad activations getting Hunters Mark on the Bronzeback, and the Stalker warps Strength, charges in, and kills it. The Feral charges Tiberion, rolling 5,5,6 for charge damage, and my opponent concedes as he will be left with one Gladiator facing down four Warpwolves the next turn. This list is a lot of fun, and the threat ranges and damage output are fairly absurd. Synergy plus Loki plus Reposition on everything means that I can usually spend a turn or two thinning out the herd before I really commit with my feat, after which not many things are going to be able to handle 3-4 DEF 16 heavies. Loki is absolutely amazing here, giving the list a seriously potent threat extender, who can often hang out 10 inches back from where his target was after yanking it in thanks to Reposition. Further testing is required, but Kaya seems very strong too. It's incredibly nice to be able to say that without also adding "and she's probably busted as well" as I had to with my Una 2 batreps. Kaya seems quite balanced and very tricky to play, definitely not an auto win button by any stretch. My dice ran a couple points hot this game, with two very sub average rolls the whole game and a couple of very above average rolls. My opponent and I agreed that mostly what that would have changed is the amount of fury sitting on Loki and the Stalker on the last turn though, as the threat ranges and damage output of the list really are just that good. I'm definitely excited to play more with Kaya, she gives Circle the hardest hitting list it can bring, and that's a very cool feeling.